About 1/2 million years ago, the Ice Age advance of the Illinoian glacier moved into western Pennsylvania and blocked the northward flow of the Monongahela River. At that time, the Three Rivers came together near East Liberty and the Mon flowed northward through what is now Junction Hollow. About 75,000 years ago, the Wisconsinan glacier moved southward to force the Mon to cut a new channel on its present course. This accounts for the size of the valley which is crossed by this 1951 bridge. Excluding the truss which ties the arch of the Fort Pitt Bridge, this is the only truss bridge constructed by the PA Department of Highways along the length of the Penn Lincoln Parkway. The side-by-side twin structures were constructed from November 14, 1949 to October 15, 1952, at a cost of $1,850,000 by B. Perini & Sons, Inc., of Framingham, MA. 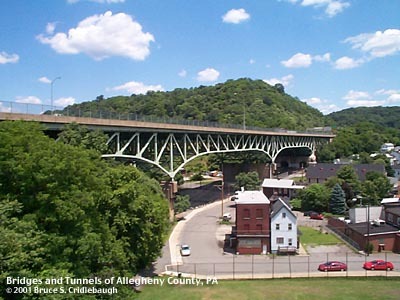 The company also excavated and lined the Squirrel Hill Tunnel and built the section of the Parkway which includes the Bates St interchange. Residents of the Four Mile Run Valley had been accustomed to entering their neighborhood beneath the Sylvan Avenue Bridge. This bridge was reconstructed in 1915 as the high steel viaduct standing today. But that structure is dwarfed by the 1,000-foot-long web of steel which looms some seven stories above the valley floor. Four truss Pratt truss spans bound across the three-story concrete bents. Two girder spans -- one cut short to a triangle by a skewed abutment -- cross the north end of the Swinburne Bridge. A comparison of the 1904 Hopkins map with the the current layout indicates Sylvan Av (later known in the location as Frazier St) once crossed Swinburne St here. Today, Sylvan St stops at Greenfield Av. Frazier St is marked on the Swinburne Bridge and is also found on the bluff of South Oakland. A 1921 street plan for Pittsburgh indicates a steep grade of up to 7.5 percent from the old bridge to the bluff. With the construction of the Parkway in 1950, this once continuous road would be severed. Previously intersecting here was Swinburne St, which is also severed today. The lower section intersects with Second Av near the Jones and Laughlin steel mill site; it dead ends at the Parkway. But the name Swinburne St continues from the north end of the Swinburne Bridge -- curls above the southern opening of Junction Hollow and ascending to South Oakland. Below the Parkway, Boundary St marks the old location of the eastern city limits of Pittsburgh. The center section of the road between Four Mile Run Valley and Oakland was closed around 1970 -- leaving Saline St as the only entrance from the south. The former Baltimore and Ohio RR mainline (aka Pittsburgh Junction RR) follows Junction Hollow northward. In 2000, an extension of the Eliza Furnace recreation trail was opened in the Hollow to link downtown to Oakland by non-motorized means. The Parkway bridge also provides shelter for a playground and basketball courts. The stream which lends its name to the valley makes only small appearances as it is mostly encased in drainage pipes. 1953 PA Dept of Highways report; Harper, John, "The Formation of the Allegheny River"